Got a question about Shredall or SDS Document Storage and Scanning? Find the answer here. We’ve listed some popular FAQs, but you may want to use the filter button to select a specific subject. What is the difference between offsite shredding and onsite shredding? If you opt for off-site shredding, we’ll collect the waste from your premises in locked containers and transfer it to a secure vehicle. Next, it’s transported to our depot to be confidentially shredded and baled in compliance with the European Standard (EN15713). You can watch this happen using our webcam. With on-site shredding, we’ll shred your confidential waste without it leaving your premises. Our mobile shredding machines can destroy two tonnes of paper per hour. How can I be guaranteed that my confidential documents have been completely destroyed? We work in compliance with EN 15713, the standard laid down by the BSIA (British Security Industry Association). This means we follow a number of security measures and that all paper is cross-cut to an unidentifiable end product. It even specifies the maximum particle size for the shredded paper. 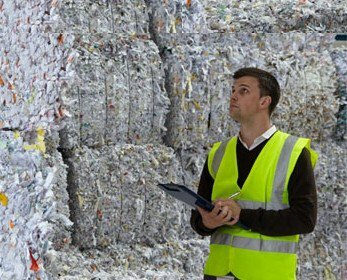 If your documents are shredded at your site, an appropriate person from your company will witness the shredding and we’ll issue a certificate of destruction straight away. If it’s destroyed off-site at our secure depot, shredding will take place within two working days we’ll issue a certificate of destruction with your invoice. For added reassurance, there’s always a full audit trail. 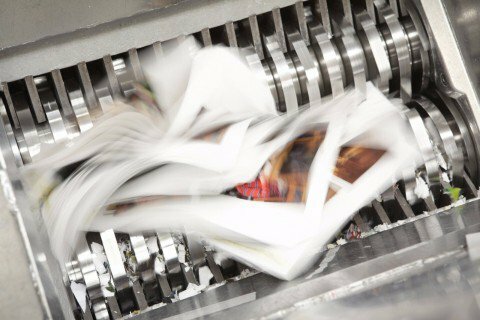 As an ISO 14001 registered company, we’re committed to recycling 100% of waste paper. We work with appropriately registered recycling partners and ensure the entire process is carried out in compliance with appropriate environmental laws and best practice. Much of your shredded waste ends up on the supermarket shelf as tissue-related products sold by recognisable brands. What if I only need a one-off service? That’s no problem – we’re in most areas of the UK on a weekly basis and we’ll happily swing by to make an ad-hoc collection. We work with anyone from private individuals to national businesses. No job is too big or too small, and there’s no need to sign up to a regular collection schedule. If you’re having a big clear out we can even provide as many lockable bins as you need free of charge. We securely destroy paper, cardboard, print waste and x-rays; used IT and WEEE equipment including computer hard drives, laptops and mobile phones; data storage including discs, tapes and videos; plastics, including credit cards; and even out-of date, unwanted or redundant products, like toiletries, branded items or uniforms. No job is too large or too small. Whether you’re a multinational corporation or a small home-based business, you can expect the same prompt, reliable service. How do I know that Shredall will do a good job? We ask our clients for feedback through our client surveys and regular review meetings, and document it as part of our ISO 9001 certification. We are a strong believer in listening to our customers and changing our systems for the better, and we use customer feedback to shape our services and systems. Are all Shredall staff vetted? Yes! Shredall comply with BS 7858 – which ensures all employees are CRB check. Pre-employment Screening, Vetting and Background Checks are made to make certain your documents are in safe hands. How do I know that my records or files stored can be retrieved easily? Our internationally recognised bar-coded software lets you track every box or file stored. Barcodes tell us your details, and the date the data was stored, retrieved, re-filed or destroyed, and who by. This gives a full audit trail of any item moving in or out of our facility. Our advanced software gives you plenty of useful functions including web-based access, document scanning and in-house barcode tracking. My existing supplier charges an exit fee – how can I make switching affordable? We offer payment plans to help you when transferring from another supplier, and we’ll tailor your plan to make sure it’s cost effective. 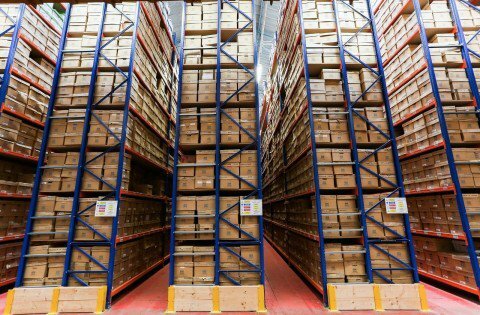 I have thousands of files and boxes – is it too much effort to move supplier? Not at all – we’ll sort it all out for you. We’ll liaise with your existing supplier to collect and transport your records securely. We’ll also assign an account manager to manage the entire process and make sure the transfer goes smoothly. Will I be able to retrieve a file of box during the uplift process? Again, not a problem. We’ll transfer boxes in manageable volumes and scan them into locations in the warehouse on the same day, so files can be retrieved straight away if needed and returned in paper form or as a scanned file. Can I have a report or track files stored online? As we record all box/file references we can provide a hard copy inventory. Or you can use SDS Software to access your account and manage documents online. You can even produce your own orders for files to be retrieved or destroyed. How quickly can files be retrieved? You can get an electronic version of a file in minutes using our scan-on-demand service. You can also get the hard copy on our next scheduled delivery, or emergency delivery within an hour. Any – no job is too large or too small. Whether you’re a multinational corporation or a small home-based business, you’ll get the same high-quality service. How do I know that SDS are doing a good job? Is there a contract between us? We draw up a service agreement for all regular shredding customers. These range from 12 to 36 months depending on you what’s best for you. For ad-hoc services we simply need a confirmation of order. Once you’re set up on our system you can use us as and when you need, with no fixed contract. For scanning and document storage services we draw up a comprehensive contract which could be between 12 and 60 months. Are all SDS staff vetted? Yes. We comply with BS 7858, which ensures all employees are DBS checked. We also run pre-employment screening, vetting and background checks to make sure your documents are in the safest possible hands.